Are you getting bored searching through pages on the likes of Trip Advisor hunting for the most practical hotel to stay in during your holiday? Maybe you’re looking for something a little more exciting and impressive for a change of pace. 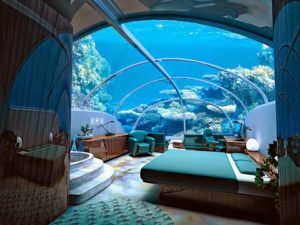 Something you may not have considered is an underwater hotel… surely there can’t be many of those within your reach? In fact, you may be surprised just how many incredible choices there are. Take a look at a few of our favourite choices and see if you fancy visiting one of these for yourself. Join “The Mile Low Club” with a romantic undersea voyage on Lovers Deep, the submarine/hotel hybrid that takes you from the location of your choice on an exciting journey beneath the sea. It may be a little pricey, but in terms of uniqueness there’s no beating this. St. Lucia is the most common starting point for this luxury undersea trip, and the company running it specialises in honeymoon packages.